Successfully Added Forecum 8F Wireless Doorbell - 300 Meter Transmission Range, Plug And Play, 4 Volumes, 36 Tunes, Energy Sufficient to your Shopping Cart. Missing out on an important delivery, visitor, or client will be an issue of the past with the amazing Forecum 8F wireless doorbell. With its plug and play design there will be no more hassle with wiring and difficult installation processes - simply attach the doorbell to your door and plug the two matching receivers into a wall power socket located anywhere in your house or office and you'll be ready to go. Having an operating range up to 300 meters the Forecum 8F wireless doorbell is the perfect feature for any modern household or office. One transmitter can be paired with up to 4 receivers meaning that, in what ever room you are located at the moment your doorbell is being pressed, you will be able to hear it ring. Featuring 36 different ring-tones and 4 volumes you can be assured that this wireless doorbell will notify you in a way that suits your style. Being a wireless transmitter this elegant device brings along a number of other usage options and is not bound to be used as a wireless doorbell. With its sleek design this bell can alternatively be placed inside where it can be used for numerous options. Why not place the transmitter in your downstairs kitchen and place the two receivers in your children’s bedroom? Now you will have the perfect device to notify your children when dinner is ready. Additionally it could be used as a wake-up call, ensuring that your teenagers will never be late for school again. 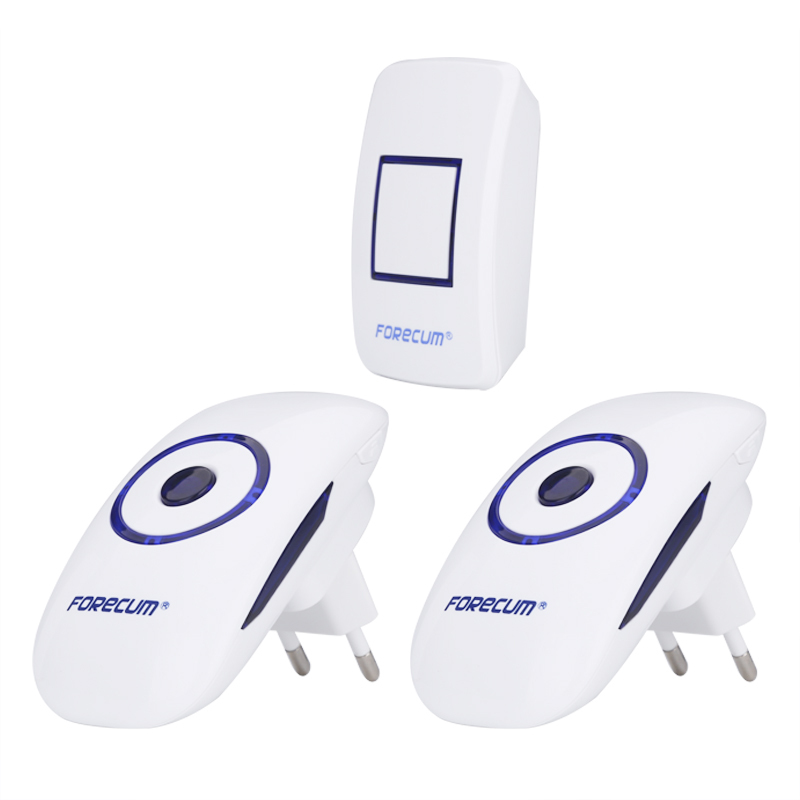 The Forecum 8F wireless doorbell could furthermore offer a helping hand to those of you who live with people in need such as pregnant women or elderly. Being wireless the transmitter is portable and can be carried around by those in need. Simply press the button and an alarm will be sent out to the receivers located throughout the house, informing your loved ones and caret givers that their help is needed. No matter for what purpose you use the Forecum 8F, it is the perfect little accessory for every modern household out there. The Forecum 8F comes with a 12 months warranty, brought to you by the leader in wireless transmitters as well as wholesale electronic gadgets..
Arabic: - جرس الباب اللاسلكية فوريكوم - Chinese Simplified: - 深圳福康无线门铃 - Czech: - Forecum Bezdrátový zvonek - Dutch: - Forecum-Draadloze deurbel - French: - Sonnette de porte sans fil Forecum - German: - Forecum Wireless Türklingel - Hebrew: - פעמון אלחוטי Forecum - Hindi: - Forecum वायरलेस घंटी - Hungarian: - Forecum vezeték nélküli csengő - Italian: - Campanello senza fili Forecum - Japanese: - Forecum ワイヤレス ドアベル - Korean: - Forecum 무선 초인종 - Malay: - Loceng pintu tanpa wayar Forecum - Norwegian Bokmål: - Forecum trådløs ringeklokke - Romanian: - Usa Forecum Wireless - Russian: - Forecum беспроводной дверной звонок - Spanish: - Timbre inalámbrico Forecum - Thai: - กริ่งบ้านไร้สาย Forecum - Turkish: - Forecum kablosuz kapı zili - Vietnamese: - Chuông cửa không dây Forecum.